The sunny health fitness SF-RB4602 high capacity recumbent exercise bike with a maximum user weight of up to 350lbs delivers an excellent workout while Reclining and exercising in a very comfortable position. 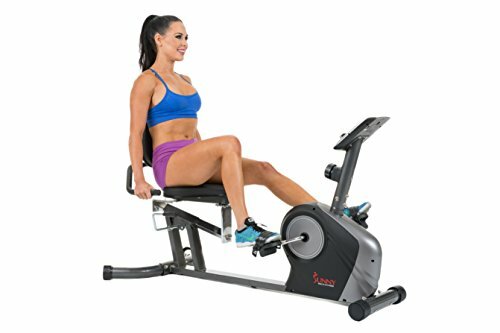 With the help of an 8 level adjustable magnetic tension system and an easily adjustable seat mechanism you'll be able to make the cycling action as intense and challenging as you can handle to help burn calories and tone your legs and glutes. It comes equipped with a large LCD screen that displays time, distance, speed, and calories. It features a large cushioned seat and back support, slip-resistant pedals with straps and handle bars for a comfortable and complete body workout. Compact and stable, this recumbent bike provides one of the most ergonomic and low-impact style you can find; featuring a walk-through design for easy and comfortable workout.